Burnaby Dog Groomers Site Launched! Professional Dog Groomer Carmen Ballard is Happy to Announce the Launch of the Posh Dog Grooming Services Website! Posh Dog Grooming Services in Burnaby BC is a full-service, home based pet grooming salon for all dog breeds, with a focus on cutting and styling smaller dogs. Carmen’s focus is on creating a stress-free dog spa environment for you and your dog(s) so you both can enjoy the experience, which lets her wash, scissior, clip and style your dog to “best in show” grooming standards you’ll love. 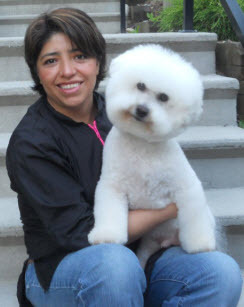 She is familiar with all breed cuts and will also style your dog to your personal preference. In fact, Carmen is so confident in her abilities she offers an industry leading, 100% satisfaction guarantee or your money back. Full details of the guarantee are available on the site. If you’re looking for a dog groomer in Buranby with a huge heart for dogs, years of experience in grooming dozens of breeds with flexible appointment times – that’s Posh. Carmen would like to thank her clients from North Vancouver, Vancouver, New Westminster and beyond for letting her use their dogs images on the website and the kind words they shared on the Dog Groomers Reviews Burnaby BC page of the website. If you have any questions or suggestions for the site please call Carmen at 778-918-9178 seven days a week from 9:30 am to 8:30 pm for your convenience. with Spike, one of her two dogs"
If for any reason you are not 100% satisfied with my dog grooming let me know and I'll either make it right or you pay nothing and I will give you a full, prompt and courteous refund. Many people ask me how I can offer such a bold guarantee? The fact is, there is virtually no risk on my part. You see, after grooming hundreds of wonderful dogs, I have the experience, expertise and confidence to give you this NO RISK offer. Give me a call at 778-918-9178 and I'll be happy to answer your important questions and check my availability for your dogs first grooming appointment.